Mother’s Day is an important holiday, a day we take to express our love and make our moms feel extra-special, showering them with attention as well as gifts and treats. 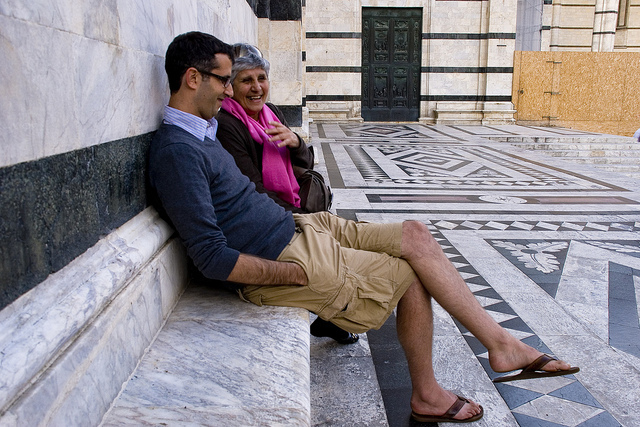 Mother’s Day is celebrated not only in the U.S. but all over the world, and of course Italy is no exception. 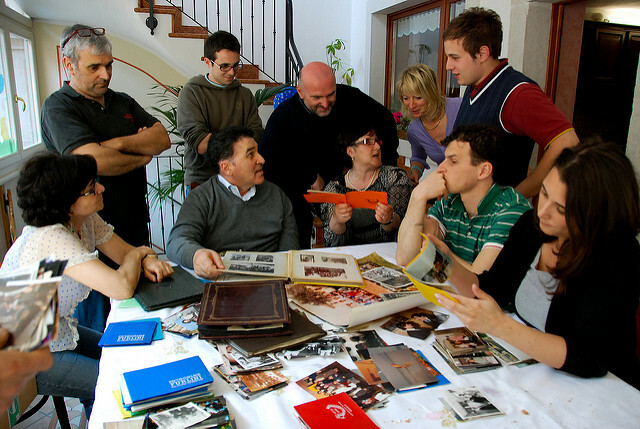 Today we are going to shed a little light on what makes Italian moms and women in general so special (at least in the minds of Italians), and what role Italian moms play in the family as well as society. If you ever visited Italian playgrounds on a weekend you would have noticed that mostly dads are there playing with kids, while moms are often chatting with their girlfriends on the side. This is not because Italian moms are too lazy to play with kids. In fact many of them dedicate all their time to kids and family, which is why every day off that dads get they often spend with their kids. Despite changing times, now like in the past, many Italian women with kids do not work outside the home. Nursery schools and kindergartens close around 1pm, while school day is over at 4pm, making it very challenging for Italian moms to do full time work outside the home. So moms care for the kids, but the term “care” doesn’t even begin to describe the commitment of moms to their kids. This entry was posted in Italian and Venetian Holidays & Events, Italy and tagged Holidays, Italian Traditions on April 21, 2015 by GlassOfVenice. 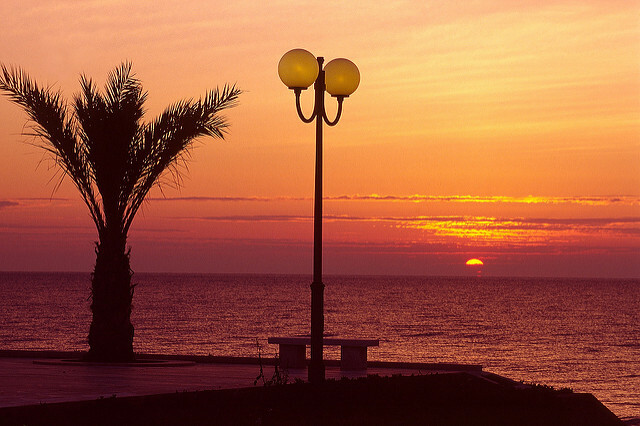 This entry was posted in Italian and Venetian Holidays & Events, Italy and tagged Italian Traditions, Italy Travel on April 18, 2014 by GlassOfVenice. 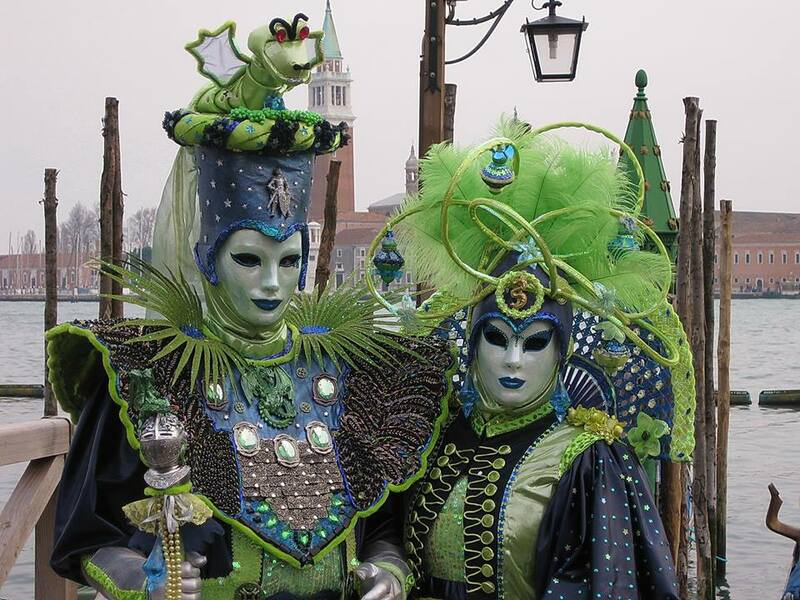 Venetian Carnival, an intriguing mix of gorgeous masquerades, street fairs, high-end balls, and tourist craze set against the beautiful backdrop of Venice, is one of the most famous and highly anticipated events in the world. The Venetian Carnival in its present form has been celebrated since 1979 when Italian government and Venetian civic society decided to revive it as an attempt to re-ignite interest in Venice and its rich traditions. However, the original Venetian Carnival has a long history that dates back to the 12th century, if not earlier, and many of the traditions and glamorous highlights of today’s Carnival come straight from the Middle Ages. 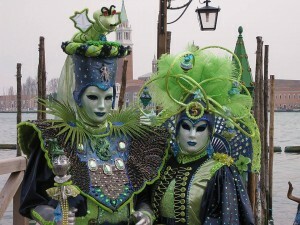 Many scholars agree that Venetian Carnival has its roots in Christian tradition and that it has likely evolved as a way for people to indulge in life’s pleasures and have fun in the days before the solemn period of Christian Lent (a time of sorrow and reflection leading up to the Holy Week). 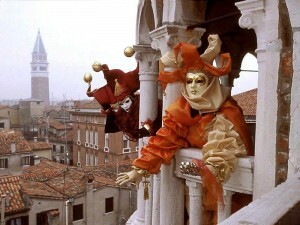 One of the theories is that the Italian word “Carnevale” comes from the two Latin words “carne” meaning meat, and “vale” meaning farewell or goodbye, signifying the fact that during Lent people had to fast, avoid temptation, and give up life’s luxuries, in order to concentrate on prayer, reflection, and self-denial. 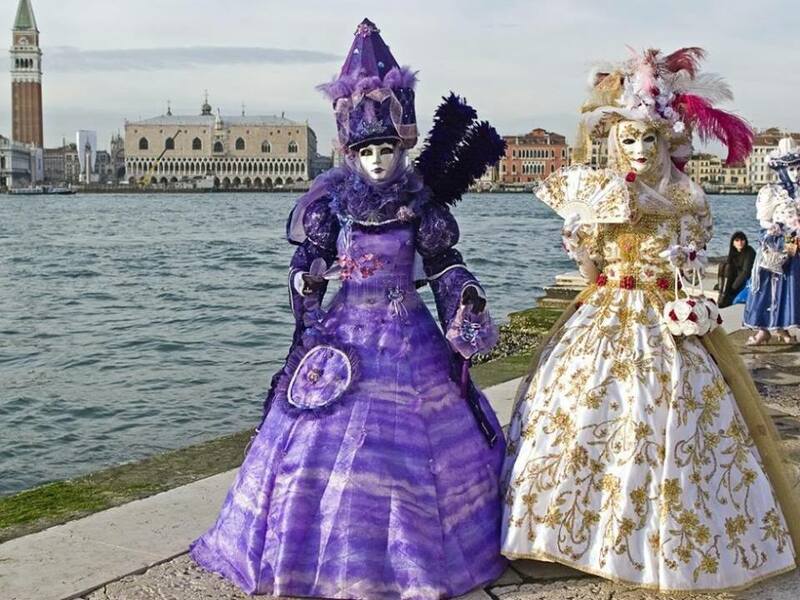 This entry was posted in Venetian Traditions, Venice and tagged Italian Traditions, Venice, Venice events on February 11, 2014 by GlassOfVenice. As we all know, Venice is one of the few remaining cities that changed very little over the last few centuries. In the spirit of retaining it historic and cultural identity, Venetians keep many of their age-old traditions alive, the most important of which is annual Venetian Carnival. 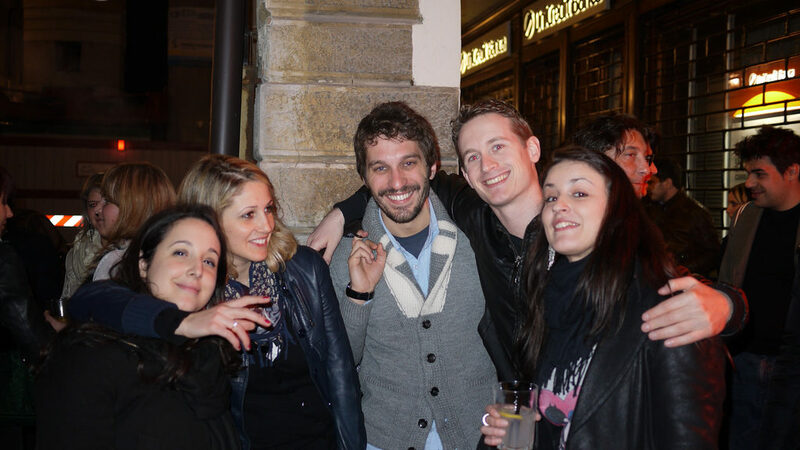 This year the Carnival will take place from February 11th to 21st. If you have never been in Venice during the Carnival, you should definitely make plans to go and experience the magic, enchantment, and breathtaking beauty of Venice as it was meant to be. February is a dull and dreary month in Europe, but not in Venice, thanks to the Carnival which brings out colors, celebrations, music and historic events onto the streets of Venice. 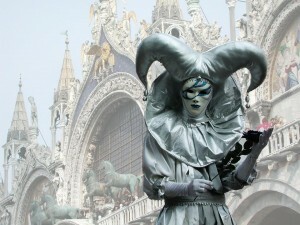 A tribute to Venetian extravagance and decadence, one of the most interesting introductions for the 2012 Carnival will be the Wine Fountain set up in St. Mark’s Square. Set up in front of the Doge’s Palace, this unusual fountain will cast out fine wines produced in Venice which will be offered to the public. Carnival will be opened on February 4th with the official toast made by this Fountain, and, after the opening toast, in a truly Venetian enchanting scene, everyone will be dancing waltz in the Piazzetta San Marco. Another important part of the Carnival festivities is “The Angel Flight”, a traditional flight of a secret guest of the city of Venice, from the top of the bell tower of St. Mark’s down to the centre of the square. An internationally acclaimed star, whose name has not yet been revealed, will wear a gorgeous Carnival costume and the magical flight will pay homage to the events of the centuries past. 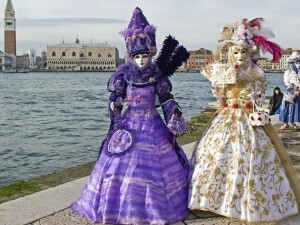 The Venetian Carnival will end on Tuesday, February 21st 2012, with the Rowing of Silence: a picturesque procession of ornate historical boats along the Grand Canal from Rialto to St. Mark’s Square with no artificial lighting. All the gorgeous palaces overlooking the largest Venetian Canal will be lit entirely by candles, and motor boat traffic will be prohibited, recreating the atmosphere of Venice in the middle ages and allowing us to see the magical and unreal Venice just the way it appeared to the travelers centuries ago. Whether you manage to travel to Italy for the Carnival or choose to stay at home, we hope you don’t forget another important festival of Love that we celebrate here in the U.S. – The Valentine’s Day. And what better way to show your love than with a piece of authentic Murano Glass created right in the Capital of Romance, the timeless and beautiful city of Venice! To help you celebrate and announce your love we announce Special Valentine’s Day Sale from GlassOfVenice. We invite you to take advantage of our limited time Valentine’s Day Special and get 15% OFF everything on our website when you use coupon VALSALE15 during Checkout until February 15th, 2012. Plus, as always, get free shipping in the U.S. on all orders over $100 and discounted shipping on all other orders. Become our Fan on Facebook and Follow us on Twitter @GlassOfVenice to stay up to date on our promotions and updates. This entry was posted in Venice Events and tagged Authentic Murano glass, Italian Traditions, Italy Travel, Murano glass shopping, Venetian Art, Venice, Venice events on January 16, 2012 by GlassOfVenice. 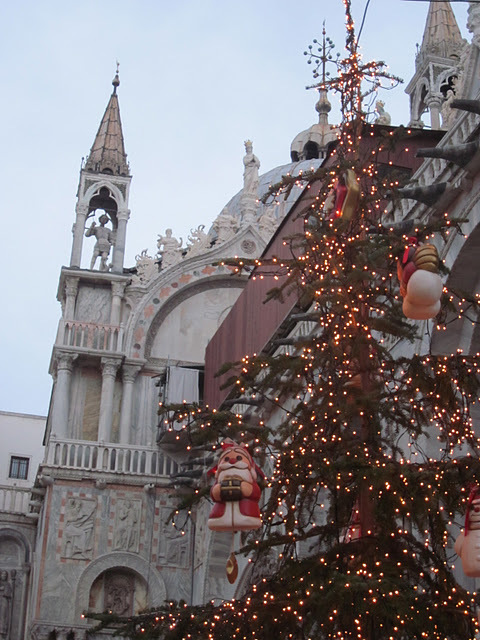 Christmas is an enchanted time, especially when it’s celebrated in the enchanted city of Venice. Winter Holidays bring special cheer and magic to Venice and we will give you a quick overview of Venetian celebrations and events this holiday season. This year Venice set up its largest skating rink ever on Piazza San Polo surrounded by a traditional Christmas market. At the market you can buy Murano Glass, Venetian masks, and other local artisanal products, as well as try great local food and wine. When you get tired of skating and feel like getting a culture fix, you can visit a very interesting exhibition in Murano Glass Museum on the island of Murano, entitled “1861-2011: UN’ISOLA, UN’ARTE, UN MUSEO” (translated as “One Island, One Art, One Museum”). This retrospective exhibition dedicated to the long history of Murano glass-making offers insight into Murano Glass tradition and showcases almost two hundred of the most significant items in the Museum’s collection made in the last 150 years. If you are in Venice over the Holidays, you will get a chance to enjoy some colorful centuries-old Christmas traditions honored here and in the rest of Italy. One of them is Messa di Mezzanotte, Christmas Mass that starts around midnight. After the Christmas dinner, families head out and walk brightly decorated streets to a candle-lit church, where choirs sing Christmas songs and create true Christmas spirit. Evoking spiritual traditions of the centuries past, festive and beautiful Messa di Mezzanotte is an event not to be missed. After Christmas, all eyes turn to the New Years with its own share of colorful celebrations and interesting traditions. Make sure to eat lentils on December 31st to attract money and riches in the new year. Lentils symbolize coins, and, according to the Italian tradition, the more you eat, the more money you’ll get. On New Year’s eve, most Italians serve their lentils with either cotechino (pork sausage) or zampone (pig’s trotter stuffed with the same filling as cotechino). 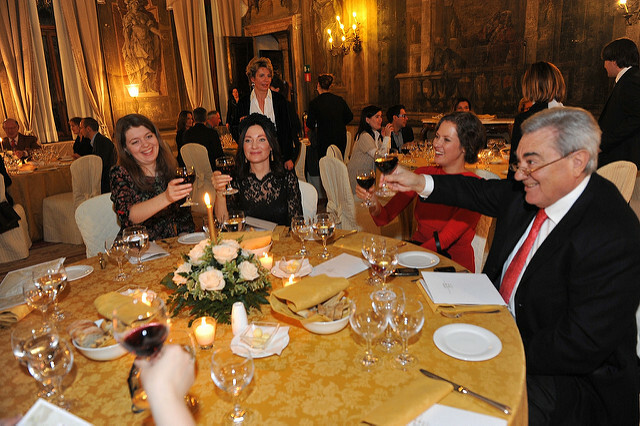 After this feast, head to Piazza San Marco, where New Year celebrations take place. The festivities focused on beauty and romance and entitled “The Love Celebration” will continue through the night and culminate with the spectacular fireworks over the Venetian Lagoon. 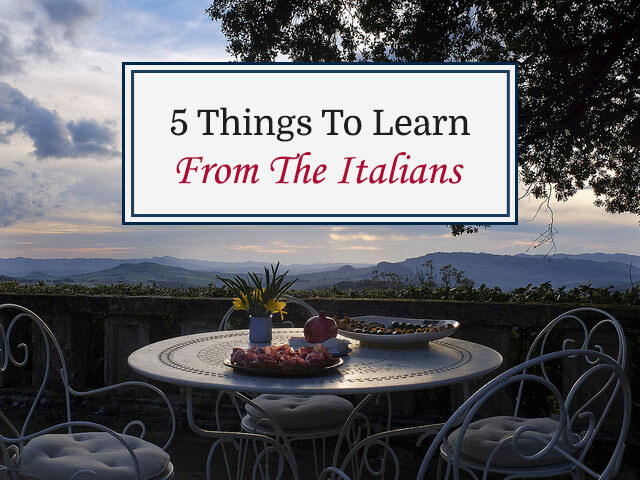 Whether you manage to travel to Italy this Holiday season or just enjoy reading about Venice and Italy, we hope you get a cue from Italians and remember to take a break to enjoy good food, festive atmosphere, art, and the company of friends. Happy Holidays from all of us at GlassOfVenice and best wishes for happy and prosperous New Year! Remember to take advantage of our limited time Holiday Special and get 15% OFF everything on our website when you use coupon DECSALE15 during Checkout until January 1st, 2012. Plus, as always, get free shipping in the U.S. on all orders over $100 and discounted shipping on all other orders. 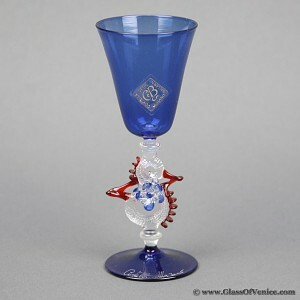 This entry was posted in Italian and Venetian Holidays & Events, Venice News and tagged Italian Traditions, Italy Travel, Murano Glass History, Murano glass making, Venetian Art, Venice, Venice events on December 21, 2011 by GlassOfVenice.